This is part 5 in a series of posts comparing Amazon leadership principles with Scripture. Today’s post is about Vocally Self Critical, Earns Trust of Others, and Dive Deep. The previous post was about Think Big; Bias for Action; Frugality and you can see the full list here. Today’s leadership principles seem focused on making sure Amazon remains a truth-seeking organization instead of one that succumbs to social cohesion. Have you been tempted to cover up mistakes and bad news? In our theology of technology group, we shared different situations where we’ve faced this difficulty. It’s tempting to give the appearance that you or your team are progressing more quickly than you actually are, especially when reporting to upper management. It’s tempting to remain quiet while others are telling a rosy story or making promises that are nicer than reality. As leaders, we should speak up and make sure the truth is heard even though we risk making our team (or ourselves) look bad. When you tell the truth despite its social repercussions, you encourage others to give you honest feedback and many times pre-empt the need for others to criticize you (a sort of corollary to Proverbs 27:2). Of course it’s still possible reject critical feedback outside of the ways you are willing to criticize yourself, so this is not a substitute for peer feedback. As Christians, we have great freedom to be vocally self critical because the truth about our most depraved condition is fully known God and yet he thoroughly loves us and has given us full access to himself through Jesus Christ (Hebrews 4:14-16). Even though speaking up for the truth can have painful social consequences, we do it because we love the truth and our neighbor (1 Corinthians 13:6). David throughout his Psalms demonstrated a vocally self critical attitude in his confession towards God (Psalm 32) and an opposite would be the hypocritical Pharisees that Jesus condemned (John 8, Matthew 7:1-5). We began describing two types of trust-earning activities, which seemed to be different than the receptivity described by this leadership principle. The first was a case where a senior developer took the time to teach a junior developer. By explaining his thought process, asking guiding questions, listening and demonstrating the merit of his ways, this developer earned the trust and respect of the junior developer. There are other instances where senior developers may be more pre-occupied with their own work or dogmatic about some point instead of reasoning with and persuading others about their approach. The second way to build trust over time was to under promise and over deliver—basically making and keeping the promises you make over time builds trust. However, the description for this principle seems to lean toward earning trust by listening to others and being open to their feedback and ideas—a kind of continuation of being vocally self critical. This is particularly powerful when exercised by someone in authority because it is moving along the lines of Jesus’ teaching that leaders are not to lord their authority over others (as expressed by authoritarian stubbornness), but to use it to serve others (Luke 22:24-26, 1 Peter 5:2-4). Even so, it can be frustrating dealing with someone who gives the appearance of receptivity, but ultimately is seeking to manipulate the situation to their advantage or confirm what they already desire (see for example Rehoboam who rejected the advice of his father’s counselors). As believers we ought to be truly receptive and likewise forthcoming in speaking the truth to each other (Psalm 32:9, Proverbs 1:7, Ephesians 4:15, 25). What is the difference between diving deep and micromanaging? Most of the time we’ve seen leaders dive deep at Amazon for the purposes of understanding and accountability rather than in order to directly control every action a team is making. Leaders are willing to dive deep and can quickly get to the heart of a matter, apprising themselves of the true situation. Regularly diving deep creates an atmosphere of accountability because it means that you have to know your stuff when you present and share facts with others. Why is it tempting to stay high level instead of diving deep? When we’re under deadlines, it may seem like we don’t have enough time to dive deep and really understand a problem, technology or spreadsheet. There is a balance between knowledge exploration and exploitation, and the intuitions about when to dive deep and when to leave things at an abstract/aggregate level seem to be gained through experience. When you do see a problem, diving deep is a form of taking responsibility since if you choose not to solve it, someone else probably will have to. This is also a way for leaders to earn the trust of others since peers and followers know that you know what is really going on and that you are taking care of it. How can we overcome the tendency towards social cohesion and promote a truth-seeking culture in our families, churches, teams and wider communities? 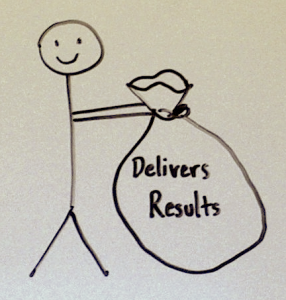 Please leave a comment and read the next post on Have Backbone, Will Disagree and Commit; Deliver Results. This is part 4 in a series comparing Amazon leadership principles with Scripture. Today’s post is about Think Big, Bias for Action, and Frugality. The previous post was about Are Right, A lot; Hire and Develop the Best; Insist on the Highest Standards and you can see the full list here. How can you think big while remaining realistic? In Amazon we often test the big ideas with a press release to socialize the idea and gather data followed by a prototype. Oftentimes a big idea may be rejected not because it is flawed, but because the people it is presented to cannot conceive of how it is possible. In such cases a prototype can help people take the idea seriously. What prevents us from thinking big? We discussed two types of obstacles: busyness and fear. It is easy to get trapped in the details of work and lose sight of the bigger picture/possibilities. For developers, the iterative cycle of two week incremental sprints lends itself to forgetting where you are going. To overcome this, some teams schedule brainstorming sessions to take a step back and dream. Using the 5 Why’s can also help uncover bigger ideas. It is also easy to fear failure or rejection for promoting big and bold directions. Great ideas can be quickly squashed by a desire for social cohesion. In such cases collecting data by experimenting and talking with others can help build up sufficient momentum to overcome these obstacles. Is it prideful to “Think Big”? In his parable of the talents, Jesus in fact condemns the lazy servant who takes no risks and gets no return on investment for his master (Matthew 25:26-27). So, it seems that although it is possible to “think big” for prideful reasons, it is just as possible to “think small” for selfish reasons. In Amazon, thinking big is always designed to deliver more value to customers and similarly as Christians, we can always be thinking big for Christ’s purposes. 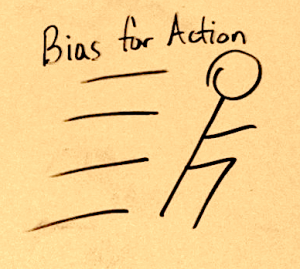 Why is it difficult to have a bias for action? It’s tempting to delay decisions until they are made for us because it is scary to take responsibility for an unknown outcome. For example, Saul faithlessly cowered with his 600 men instead of attacking, while Jonathan by faith exhibited a bias for action and achieved a victory for Israel. How does a bias for action fit with waiting on the Lord? We discussed the nuances of waiting on the Lord vis-à-vis acting, but didn’t arrive at a conclusive summary. We should not confuse procrastination or avoiding responsibility with waiting on the Lord—sometimes we already know what the Lord wants us to do, but haven’t accepted his answer. An example would be the faithlessness of the Israelites who refused to enter Canaan when the Lord told them to go and then went when he told them “no” (Deuteronomy 1). As these various Scriptures illustrate, it seems that there is a place for action and stillness and at the root of both is complete trust in the Lord. So let us take action, make decisions, and calculated risks by faith in God instead of succumbing to analysis paralysis or anxious toil. How can a person be frugal and generous at the same time? We didn’t get to examine the effects of frugality like resourcefulness, but we addressed the principle itself. It seems that frugality is a mindset, which strategically arranges its assets towards its aim. In Amazon this aim is customer obsession—delivering more value to our customers (often in the form of lower prices). As Christians, our aim is God’s glory. So, although we did not get to explore all the dimensions of frugality, stinginess and generosity, in the least we saw that it does not mean a generic miserliness. We practice thrift in certain areas so that we can be generous in the areas that matter to God. How does faith in Christ empower you to “Think Big”, exhibit a “Bias for Action”, and practice “Frugality” for his strategic purposes? 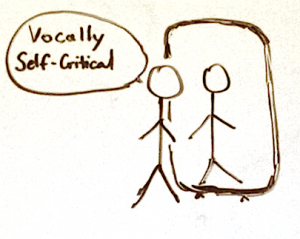 Please leave a comment and read the next post on being Vocally Self Critical, Earning the Trust of Others and Diving Deep. This is part 2 in a series of posts comparing Amazon leadership principles with Scripture. Today is about Ownership and Invent & Simplify. The previous post was about Customer Obsession and you can see the full list here. You share in the long term risks and rewards of the things under your ownership. How is ownership different than stewardship? Although they are different, a good steward always acts in the best interests of their owner, so that the actual behavior is similar. We had an interesting segue into the history of English trust law. We also cited John 10:11-13 where Jesus distinguishes himself as the good shepherd who lays down his life for his sheep vis a vis hired hands who don’t inherently care for the sheep. Can you act like an owner even when you don’t feel like one? You may not be an owner, or you may not have the influence to affect change and benefit from the outcome of your decision. Selfish ambition, where we use what we have to get ahead in the short term instead of doing what is right in the long term for others. For example, designing a system for the short term, expecting to get promoted and switching to another team so that we don’t have to deal with the consequences. Disagreement with authority where we feel disempowered, having to only take on the consequences and responsibilities of ownership without having the freedom and rewards of it. As Christians, even though we may be hired hands, God is the master. He has entrusted a stewardship to us and our reward is guaranteed by him (Colossians 3:23-24), even if we cannot trace out the connection between the responsibilities we fulfill today with the rewards that come in the future. How have you seen Invent and Simplify exemplified in Amazon? Since Day 1, Amazon has been about innovating on behalf of customers. We see it everywhere from building the kindle to deliver a simpler experience for acquiring and consuming content to inventing new ways for sellers to put things for sale on our site. Are there limits to Invent & Simplify? Sometimes we make the mistake of reinventing the wheel. We shouldn’t invent for the sake of inventing. Amazon is full of smart people, so it often times seems simpler to solve a problem oneself instead of collaborating and doing the higher level work that can produce simpler and more general solutions. Without invention though, we would lose our edge and also a lot of the fun we have creating (which is very satisfying since God made us to be sub creators). How has being a Christian required you to accept being misunderstood for long periods of time? In general any initiative to change the status quo requires being misunderstood for long periods of time. Jesus was misunderstood for long periods of time by his contemporaries, both opponents (Luke 7:34-35) and disciples (John 13:6-7). If you’re willing to stretch things, one could even say that he “invented & simplified” the way of salvation by solving the problem of sin through his death in our place and introducing righteousness by faith. As believers we may endure prolonged seasons of persecution or being misunderstood before the gospel impacts someone’s life. 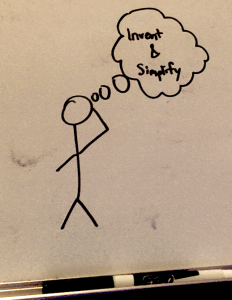 How can we apply “Invent & Simplify” to gospel goals? God suffers in the multitude of souls whom His word can not reach. Religious truth is imprisoned in a small number of manuscript books which confine instead of spread that public treasure. Let us break the seal which seals up holy things and give wings to Truth in order that she may win every soul that comes into the world by her word no longer written at great expense by hands easily palsied, and multiplied like the wind by an untiring machine. Inspired? Please leave a comment below! 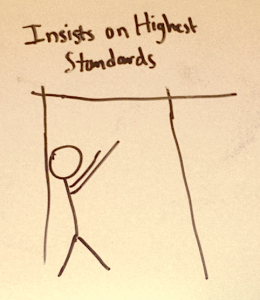 Check out the next post on Are Right, A lot; Hire and Develop the Best; Insist on the Highest Standards.